A rejuvenating anti-aging face serum formulated to soften fine lines, and restore healthy glow to skin. 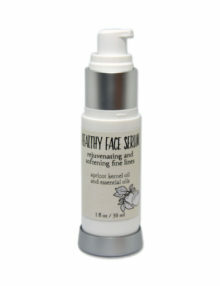 Apricot kernel oil is rich in essential fatty acids which helps soothe dry skin. Rosehip oil can repair damaged skin cells, fine lines and wrinkles. Carrot seed oil can stimulates the growth of new skin cells and is extremely rich in beta carotene and antioxidants. How to use: Apply a small amount to face and neck after cleansing and toning, then blend lightly and quickly all over. Follow with Healthy Face Moisturizer. Avoid contact with eyes. Store in a cool, dry place.